Chocolate covered pretzels are the perfect combination of sweet and salty with a satisfying crunch. These decadently delicious treats are the ideal gift for any occasion — from birthdays and holidays to a thank you for a thoughtful neighbor. 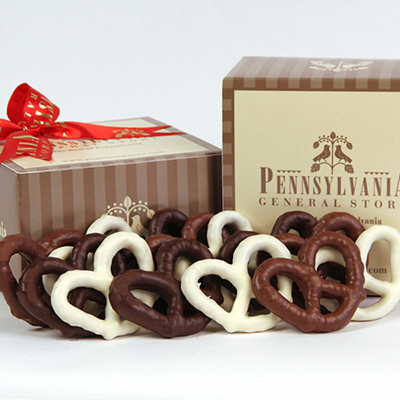 The Pennsylvania General Store offers a selection of Pennsylvania-made chocolate pretzels, including four distinctive flavors from Asher's. Souderton, Pennsylvania is home to Asher's Chocolates, the site of both the chocolate factory and their old-fashioned candy store. 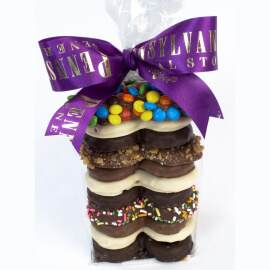 For five generations Asher's has been making fine chocolates including their chocolate covered pretzels. Today, let us make it easy for you to indulge in Asher's milk chocolate covered pretzels with jimmies, M&M's, nonpareils, or toffee. Can't decide on just one? Try all four! Fun Food Fact: Jimmies and sprinkles actually are the same thing. In Pennsylvania (especially the Philadelphia area), Boston, and many cities of New England, the little colorful candies that top chocolate covered pretzels, cupcakes, and ice cream are called jimmies. In New York and other cities across the U.S., this tiny candy topping is called a sprinkle. Historic sources suggest that the baker Herr Franz Joseph Leibniz along with a neighboring chocolatier should be credited with developing the chocolate covered pretzel sometime in the mid-1500's in Hamburg. More than 500 years later, this treat still delights all ages. 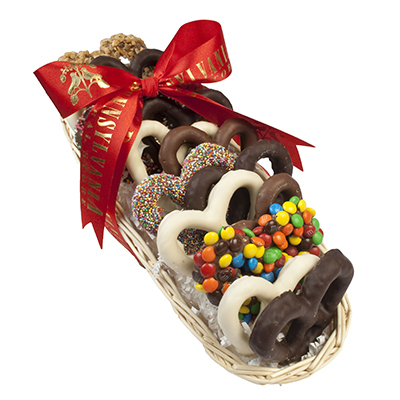 A gift of gourmet pretzels wrapped with a colorful bow or packaged in a box, tin, or basket are a great way to show someone how much you care. 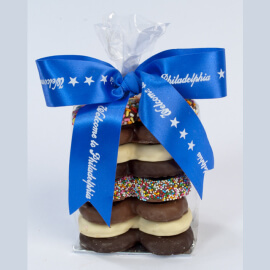 Send a student far from their Pennsylvania home a gift box filled with pretzels coated in rich dark chocolate, milk chocolate, and white chocolate. 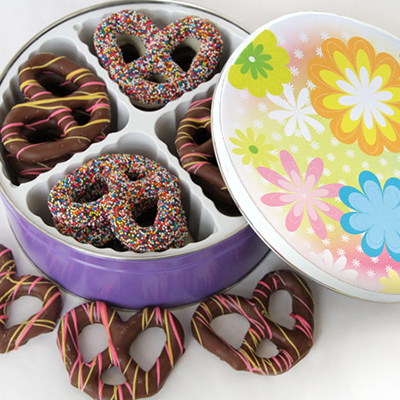 Surprise a good friend with a tin of chocolate pretzels on their birthday or send a tin as appreciation to a client or colleague. 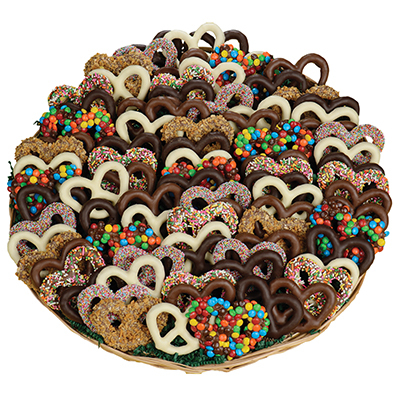 We offer chocolate covered pretzel party trays in three different sizes as well. Guests will love sampling each gourmet pretzel flavor, from classic milk chocolate to toffee, M&M's, and even ones with the famous Pennsylvania jimmies. 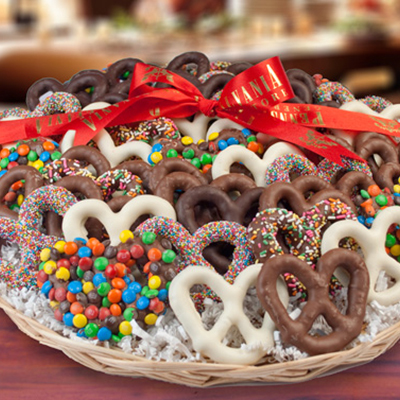 Serve our five pound chocolate pretzel tray at the office holiday party, a family reunion, or your student's graduation party. These pretzels are so good, there won't be a jimmie left. Did you know? 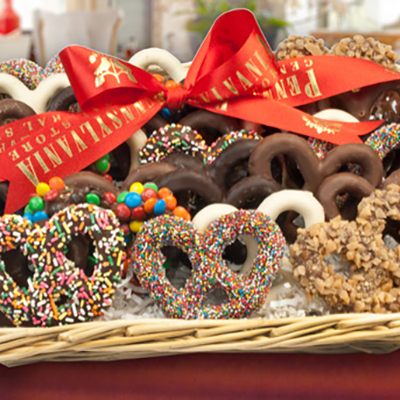 All our chocolate covered pretzel trays, gift bags, and sampler basket come with a hand-tied bow. 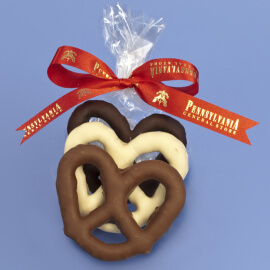 Check out all our gourmet chocolate covered pretzels today.